ROTHERHAM United midfielder Peter Holmes could be set to move out on loan again. The 27-year-old returned from a loan spell at Conference club York City three weeks ago. 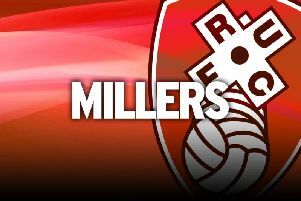 They wanted to play him in the FA Cup in the last round but Rotherham did not want him Cup-tied and Millers boss Mark Robins was mindful of the club's busy schedule. So, he recalled Holmes from York for whom he had scored on his debut in Blue Square Premier. Rotherham have sold their 1,500 allocation of tickets for the Carling Cup tie at Stoke next Tuesday although fans will be able to pay on the gate.